In a lengthy opinion by the First Circuit Court of Appeals, the court of appeals reversed a district court’s decision granting a preliminary injunction in favor of Boston Duck Tours LP (“Boston Duck”) enjoining Super Duck Tours, LLC (“Super Duck”) from using the term “duck tour” in its name and using a logo of a duck after finding that the district court committed clear error in finding the phrase “duck tour” to be non-generic for such sightseeing tours, and thereby according it too much weight in its likelihood of confusion analysis. See Boston Duck Tours, LP v. Super Duck Tours, LLC, Case Nos. 07-2078, 07-2246 (1st Cir. June 18, 2008). For a copy of the lower court decision, see Boston Duck Tours, LP v. Super Duck Tours, LLC, Civil Action No. 07-11222-NMG (D. Mass. July 13, 2007) (courtesy of The TTABlog®, which has a write-up on the district court decision here). 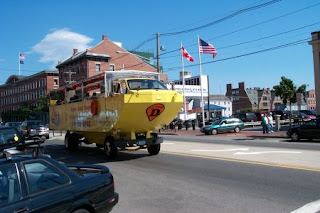 Boston Duck and Super Duck both offer sightseeing tours via land and water in the Boston area, using amphibious vehicles commonly referred to as “ducks” (DUKWs are amphibious army vehicles which function as both trucks and boats). 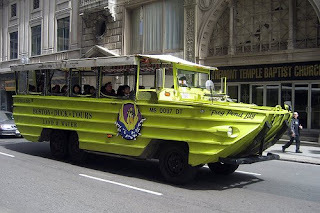 Similar amphibious vehicle land/water tours are found in many other cities throughout the U.S. and many use the phrase “duck tour” and have various logos featuring a cartoon duck. Boston Duck has been offering its sightseeing tour since 1994 using old World War II DUKWs painted with a rainbow of colors and marked with the Boston Duck logo. Super Duck began offering similar services in 2001 in the Portland, Maine area using custom-made, modern amphibious vehicles called Hydra-Terras. The company adopted the name Super Duck Tours to play on the fact that its vehicles were bigger, stronger and newer than old DUKWs and adopted a logo of a white cartoon duck with an orange bill, muscular arms, and a cape parodying Superman and the slogan “It's a bus. It's a boat. It's a Super Duck!” Super Duck entered the Boston market after purchasing an existing tour company. 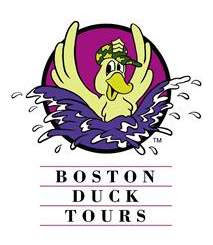 The company began offering its tours in May 2007 – concentrating on the Boston waterfront area and avoiding the Back Bay area which is the focuse of Boston Duck’s tours. On July 2, 2007, Boston Duck filed a complaint against Super Duck, alleging federal trademark infringement in violation of Section 32 of the Lanham Act, 15 U.S.C. § 1114, federal and state unfair competition, tortious interference with prospective business relationships, and a other state and federal claims. Boston Duck also sought to enjoin Super Duck from using its name and logo, or any similar mark confusingly similar to Boston Duck’s marks. Boston Duck owns several federal trademark registrations for the word mark BOSTON DUCK TOURS as well as the design mark pictured above (duck and tour disclaimed) for “conducting sightseeing tours.” Super Duck has one federal registration for the word mark SUPER DUCK TOURS on the Supplemental Register in connection with its tour services. In granting Boston Duck’s motion for a preliminary injunction, the district court found the term “duck tours” to be non-generic for amphibious sightseeing tours in the Boston area, and therefore capable of trademark protection. The district court further determined that Boston Duck had established a likelihood of success on the merits of its trademark infringement claim and enjoined Super Duck from using the term “Duck Tours” or a “cartoon duck” in association with sightseeing tour services in the greater Boston area. Interestingly, on appeal, Super Duck conceded that that the BOSTON DUCK TOURS mark was entitled to trademark protection. Instead, Super Duck challenged the district court's conclusion that Super Duck's use of its mark SUPER DUCK TOURS is likely to cause confusion among the relevant consumer public with Boston Duck's use of its mark BOSTON DUCK TOURS. As such, the court, in addressing the generic arguments, focused on the likelihood of confusion analysis instead of whether the was entitled to trademark protection in the first place. In coming to a contrary conclusion, the court, citing the eight factor test used by the First Circuit for determining likelihood of confusion set forth in Pignons S.A. de Mecanique de Precision v. Polaroid Corp., 657 F.2d 482, 487 (1st Cir. 1981), focused primarily on the first factor, the strength of the mark, because the claims of genericism directly implicate the strength of Boston Duck's mark and the ultimate scope of protection afforded the mark. The court concluded that the district court committed clear error in finding that the phrase “duck tours” was non-generic by relying solely on one dictionary definition of the word “duck” without considering any other evidence for how the public perceives the term and for focusing on the separate terms “duck” and “tours,” and not the unified phrase. The court stated that the district court failed to consider certain evidence showing that the phrase “duck tours” had become generic (i.e. commonly used with no effective alternative), including media and third party use, use by other companies within the sightseeing industry, and use by Boston Duck itself which provided strong evidence against its claim that the term was primarily associated with its company rather than the services it provides. The court, noting that trademark law is designed to prevent consumer confusion between inherently distinctive marks or descriptive marks that have acquired secondary meaning and not between two similar, but generic marks, dismissed Boston Duck’s evidence of actual consumer confusion as suggesting little about whether the term is generic. In light of the fact that the phrase “duck tours” is generic for the parties' services, the court concluded that BOSTON DUCK TOURS is highly descriptive of the services Boston Duck offers. Nonetheless, the court noted that Boston Duck’s use of the mark had made it a strong identifier of Boston Duck's tour services in the Boston area, even though part of the mark (“duck tours”) was not entitled to trademark protection at all. As for similarity of the marks, with the “duck tours” part of the marks no longer a factor, the similarity came down to BOSTON vs. SUPER, which the court found reasonably dissimilar. There was no challenge by Super Duck regarding similarity of the goods and similar channels of trade. For the reasons stated above, the evidence of actual confusion was not weighted as heavily. As for Super Duck’s intent in adopting the mark, Super Duck’s use of a generic phrase “duck tours” for its sightseeing tours cannot be faulted. In the end, the court, finding no likelihood of confusion, concluded that the district court was clearly erroneous in finding that Boston Duck was likely to succeed on the merits of its trademark infringement claim. Regarding the likelihood of confusion between Boston Duck’s composite design mark and Super Duck’s logo, the court again applied the Pignons factors. In analyzing strength of the Boston Duck’s mark, while the court did not go so far as to accept Super Duck’s argument that the image of a duck splashing in water was generic for duck tour services, the court did conclude that such an image was highly descriptive of such services, and thus would be a weak source identifier, even though Boston Duck’s overall design mark was reasonably strong. As for similarity of the marks, the court found the designs as a whole -- while both contained a cartoon duck in water -- to be significantly different in overall appearance, especially when the marks other elements used in conjunction with the duck are substantially dissimilar. The court dismissed any evidence of actual confusion, finding that it could not be traceable specifically to the parties' logos. In the end, the court, finding no likelihood of confusion with respect to the parties’ logos, concluded that the district court was clearly erroneous in finding that Boston Duck was likely to succeed on the merits of its trademark infringement claim. The court reversed the district court’s injunction and remanded the case for further proceedings.